Today I am discussing catching bream from the beach and will touch on my tackle set-up the most successful rigs & methods, best times, best places and best baits to use. This is by no means exhaustive in content although, what we will touch on today has been more than successful over the years. 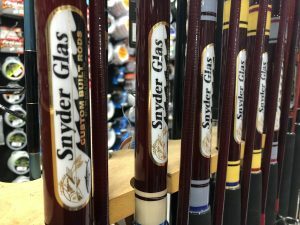 I fish with a Snyder multi taper 4 wrap 12ft, mid mount, 1 pc rod with sand-spike paired with a Pflueger Salt 060SW spinning reel. In today’s spec’s this rod would be rated 3-6kgs. 2-piece rods are also fine. I find the sand-spike offers some advantages such as allows for longer casts when/if needed and when resting the rod at the back of my vehicle for re-baiting or removing a fish the sand-spike can be slightly pushed into the sand. This will at times prevent your rod/reel from falling into the sand. The Pflueger has a large spool capacity allowing for 300m of 15lb. maxima mono. I don’t recommend braid from the beach as it has no stretch. When under heavy loan the mono. stretches with the serge of the water giving you an advantage. The reel is simple and robust, easy to clean with 9kg of drag pressure and priced under $200. I don’t recommend high end reels on the beach as they will at some stage of their fishing career fall in the sand/water or both. Bream are in greater numbers on the open beaches from about May through until about September, during this time they leave the protection of the estuary system and travel on their spawning run. My favourite time fishing from Birbui end of Stockton Beach is May and June from July onwards I focus more on Samurai Beach. Fish during this time are rowed up and on top condition. For the most part bream are a nocturnal feeder preferring the cover of darkness, you will of course take bream during the day although not as many. The best times I have found are before the sun rises and sets, overcast mornings/days offer cover as does white water. At times bream will bite well into the night. If you can combine a morning ¾ to high tide with the rising or setting of the sun it’s preferred. 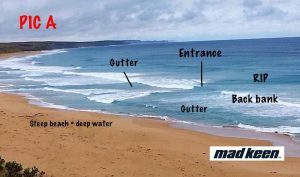 Although, fishing dead low water can also produce, I would recommend travelling further down Stockton Beach towards Newcastle, 16-22km mark where lower water offers you access directly to certain gutters that cannot be reached at the high-water mark. The moon does indeed place a part with bream as it does with other fish; bright moonlit lights are not the best. The bream tend to be smaller and are very shy when taking baits. The bream will still feed although their appear more concerned about the larger predators during these times. I fish with a simple paternoster style rig, made of 20lb. fluro carbon, 1/0 Oshanassey style hooks, number 8-10 ball sinker which I have inserted a stainless-steel ring into which allows it to fit into the snap swivel at the bottom of the rig. I have 2 single leaders with hooks which are attached to a swivel held by a loop from a dropper knot. The dropper knot swings around on itself, using 20lb. allows for less twist and small knots in the leader. 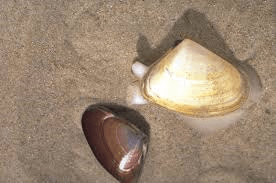 Don’t cast over the fish, during the hours darkness the fish will hunt close in, through the intertidal zone searching for pipis and worms. I simply set 2 rods out in rod holders, bream will hook themselves. Although if the fish are on I hold the rod, remember the bream will pick the bait up so give it a little line before striking. Dip the rod and or walk towards the water which will allow the fish to shallow the bait. Bream are scavenger fish and at times will take mostly anything. Although, consider the environment in which you are fishing. March into April I would recommend beach worms and or mullet baits. When the mullet move in mid-April mullet anything is worth a bait. From around May onwards on Stockton I would highly recommend pipi baits. For some reason I have found beach worms work better from Samurai, metho (preserved beach worms) can be deadly on bream and jewfish off that beach. My favourite bait, when conditions permit is the humble nipper (yabbie) they are a soft bait and you will you get 1 gentle cast with them and hang-on, if the bream are there they will inhale a nipper. 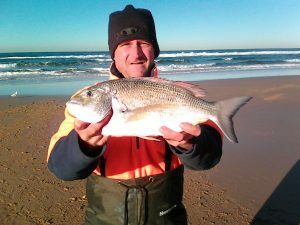 Avid fisher and Port Stephens local. New to fishing in the last 12 months I consider myself enthusiastic but not among the enthusiast grade.. Having lived in Port Stephens for 10 years now I only came across Matt and Ross at Duff’s in the past 4 months. The guy’s have helped me with gear, rigging, the when and the where, and indeed the how (and at far less cost than local competition). It’s made the experience for me more than I could have hoped for with each trip seeing more results. A really key item that I believe has helped is the quality of the bait I get from the Gents and just as importantly, who’s biting what when I come in to top up my bag (I’d never buy bait anywhere else again). They’ve been kind enough to stick around after hours to help me out with understanding my target or if I’m running a little behind time to grab something for the evenings catch with a simple phone call. They’ve happily placed that hard to find item on order for me that other larger shops happily show you back to what they sell, and not once have they tried to sell me something I didn’t need or that wouldn’t work from their own experience. I consider myself lucky to have them available to me and would recommend them to anyone from first time fisherman to serious anglers. Another great rod repair job. Better than new as always. The chat with people who actually fish is great too. Many thanks. Thanks to Matty and Ross I nailed my first big Jew, 23kg off the Break wall. What the guys told me make sense and finally paid off. Wow, what a change. We come up twice a year and Duffs shops looks totally different. Looks really great I feel like I’m fishing already. Simon Reynolds. 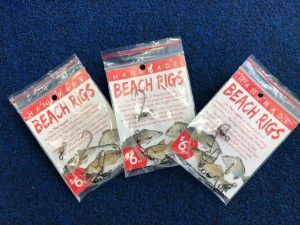 Ross and Matt understand all types of fishing , the guys are normal they set me up with my new beach gear and wow what a difference, so much lighter and well balanced. I catch more bream now than ever. Listen to us on Port Stephens FM daily from 6.20am for tips, tricks & the latest, local fishing news.